Unfortunately, as ice cream evolved over the centuries, we took out any enlivening ingredients and replaced them with processed food-like substances that steal from our health. Today, our favorite ice creams contain so much processed sugar that this once healthy food now can only be considered as a guilty pleasure. But this doesn’t mean that all ice cream has to be unhealthy. With just a couple of keto-friendly ingredient substitutions, you can make ice cream so healthy and delicious that Hippocrates himself would eat it. 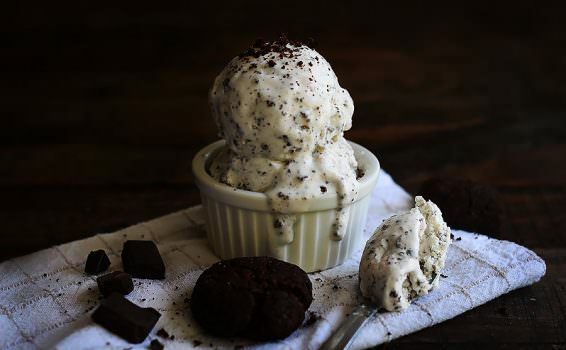 To find out how we can make this sweet treat healthy again, let’s take a look at the ten best keto ice cream recipes. Below, you’ll find a list of each individual ice cream and some information behind the health benefits of the recipe. This keto ice cream recipe combines two of our favorite sweet treats — cookies and ice cream. To replace the sugar, we use the virtually zero-carb sweetener called erythritol, which provides a subtle sweetness that really lets the flavor of the vanilla ice cream and the keto chocolate cookie crumbs come alive on your palate. By using the healthy low-carb ingredients in this recipe, ice cream won’t be a guilty pleasure any longer. The main ingredient, heavy whipping cream, will provide you with all of the healthy fat, fat-soluble vitamins, and minerals from milk without the excess milk sugar. The keto cookie crumbs will also help you take your health to the next level by providing you with fiber and cocoa flavonoids that will help improve your digestive and cardiovascular health. Altogether Keto Cookies and Crème Ice Cream is a great way to turn our two favorite guilty pleasures into a sweet treat that increases our well being. Try this low-carb ice cream out for yourself, and you will be able to experience what it’s like to please your palate without any of the guilt. I’m not a fan of eating avocados by themselves, but they are loaded with heart-healthy monounsaturated fats, potassium, antioxidants, vitamins, and fiber, so I am always trying to find any excuse to get them into my diet. So far, my favorite way of getting more avocados into my diet is by turning them into ice cream. Due to their creamy texture and health benefits, avocados make the perfect ingredient for making healthy and delicious ice cream. Plus, with this keto ice cream, you will be getting the benefits of coconut milk. Coconut milk provides you with most of the minerals found in coconut water without adding so much coconut sugar to your diet, but this isn’t the only reason I love using coconut milk. Coconut milk mostly consists of medium chain triglycerides (MCTs) — one of my all-time favorite fats. MCTs are able to skip normal fat digestion and go straight to the liver where they are converted to ketones. As a result, you feel more energized and eat fewer calories than you normally would without consuming MCTs. By mixing avocado and coconut milk together in the same meal, you will experience the benefits of arguably the two healthiest fats. As one provides you with instant energy (MCTs), the other will help improve your cholesterol levels and heart health (monounsaturated fatty acids). There is something about fall flavors like maple, pumpkin, and cinnamon that goes so deliciously well with the creamy texture of ice cream. Plus, this keto ice cream recipe calls for egg yolks, which means that it will be one of the creamiest ice creams you’ll ever try. In addition, the egg yolks will provide you with an abundance of health-promoting nutrients. Almost all of the nutrients needed to support the growth of a healthy animal can be found in the egg, including b vitamins, vitamin A, vitamin D, protein, cholesterol, fat, choline, and many many other vital nutrients. In fact, the egg is so nutrient dense that multiple health experts consider it as a “superfood” and “nature’s multivitamin.” The best part is that you’ll be able to get all of these health benefits without having to taste the yolk at all. What you’ll be tasting is the interplay between pumpkin, pumpkin spice, erythritol, maple extract, and chopped pecans that will send your taste buds to culinary paradise. While you are digesting this deliciousness, the fiber from the pumpkin and pecans and the antioxidants from the herbs and spices that you’ll be ingesting with the pumpkin spice will help improve your overall health in many ways — from healing your gut to lowering your blood sugar levels to reducing inflammation. Coffee, Chocolate, and ice cream, all mixed together — need I say more? I know I don’t, but I will anyway so that you can have a deeper understanding of this low-carb ice cream recipe. 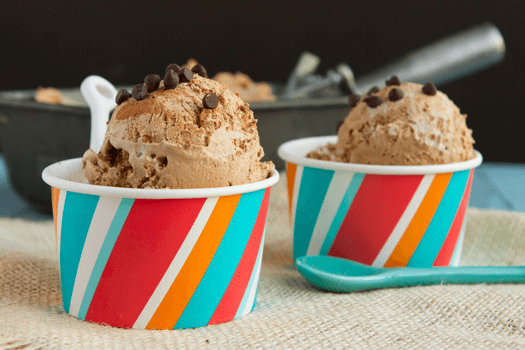 While the coffee enhances the chocolate flavor, it makes the ice cream into a coffee lover’s dream dessert. As an added bonus, the combination of chocolate and coffee will work wonders for your health and well-being. More specifically, the flavonoids in the cocoa powder will serve as prebiotics and improve digestive health. Some of these flavonoids will make it into the bloodstream where they help improve insulin sensitivity, lower blood pressure, and prevent plaque from building up in the arteries. The coffee, on the other hand, will help boost your fat burning capacity and improve your mood, physical performance, and cognitive function. The theobromine in the cocoa powder will help balance out the caffeine from the instant coffee, while the fat from the heavy whipping cream slows digestion. Altogether, this will provide you with a steady stream of sustained energy and mood enhancement. In other words, if you need a little pick me up for your mood, your energy, and your health, then don’t skip out on this keto ice cream recipe. Berries, we all could use more of them in our diet — and they make the perfect culinary companion for vanilla ice cream. Just a small keto-friendly serving of berries is all you need to get some of the most potent flavonoids, anthocyanins, and phenolic acids that you will find in the plant kingdom. What exactly are flavonoids, anthocyanins, and phenolic acids? They are non-nutritive and bioactive plant compounds that all have powerful effects on human health promotion and disease prevention. The plant compounds that are found in strawberries specifically are able to detoxify free radicals, to modulate the expression of genes involved in metabolism and cell survival, and to protect and repair DNA damage. In other words, strawberries can help prevent the most common diseases related to oxidative stress, such as cancer, cardiovascular diseases, type II diabetes, obesity, neurodegenerative diseases, and chronic inflammation. The best part about these berries is that they are keto-friendly as well. 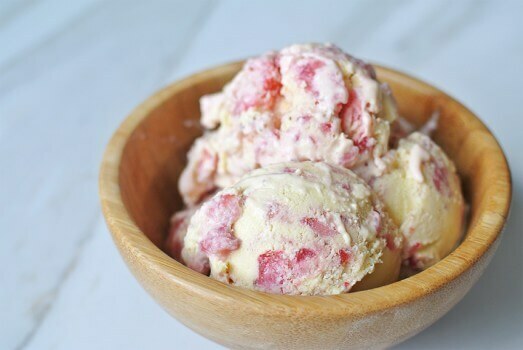 One cup of strawberries (which you will rarely eat in one day) only has 8 grams of net carbs — and you’ll barely be eating a quarter cup of strawberries when you indulge in this keto ice cream. If you are looking for a delicious way to get more fat in your diet, look no further than this, lowest of the low-carb, keto ice cream recipe. 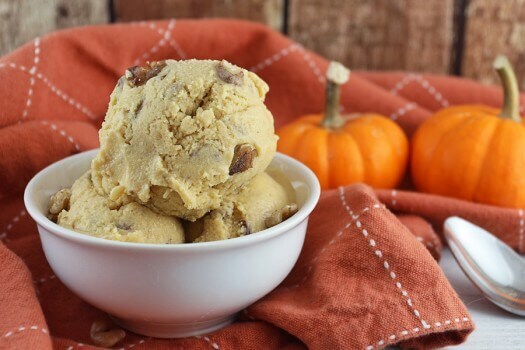 This keto ice cream is almost pure fat with a delicious nutty caramel flavor that will keep you coming back for more. 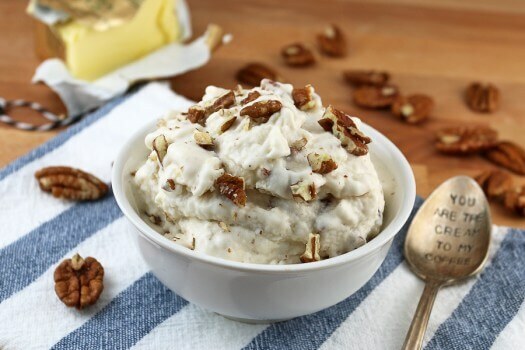 The butter and pecans are what really set this apart from other low carb ice cream recipes. The pecans provide the ice cream with a crunchy and chewy texture and a taste that add to the ice cream’s caramel-like flavor. Pecans are also great for our health, providing us with healthy fats, fiber, vitamins, minerals, and antioxidants that all help fight disease and improve our well being. The butter contains plenty of healthy fats, vitamins, and minerals as well. For example, butter is one of the best sources of butyrate and conjugated linoleic acid, two fatty acids that have been found to improve body composition and overall health. Butter also contains a relatively rare fat-soluble vitamin called vitamin K2 which is essential for preventing cardiovascular disease, cancer, and osteoporosis. To put it in another way, this keto recipe is one of the healthiest ways to satisfy your craving for nutty caramel ice cream. Go ahead, try it out — you’ll need the extra healthy fats while you are on the ketogenic diet anyway. Sometimes I’ll find myself fiending for something sweet, but once I have something sweet, I’ll want something salty — and I’ll keep going back and forth until I’m just too full. One of the best ways that I’ve found to keep this impulse at bay is by combining salty and sweet into one keto dessert. My favorite way to do this? Butterscotch Sea Salt Ice Cream. The butterscotch flavoring, flaked sea salt, and sweetness creates an ice cream that tastes very much like sea salt caramel ice cream. This recipe also calls for three different types of high-fat dairy and coconut milk, which means you’ll be getting plenty of healthy fats, vitamins, and minerals — but this isn’t the only exciting thing about this keto ice cream from a health perspective. This ice cream relies on stevia instead of sugar or erythritol to give it some sweetness. Not only is stevia super sweet, but it may lower blood sugar, improve blood sugar levels, decrease inflammation, and optimize cholesterol levels as well. In other words, with this keto ice cream, you will get salty with the sweet, and many health benefits with the healthy fats. 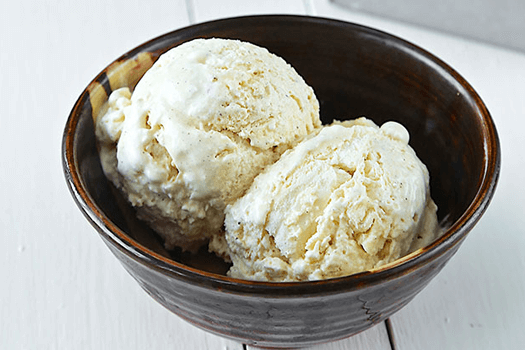 Now that you know you can keto-fy some of your favorite ice cream flavors, let’s take it back a notch to the best selling ice cream flavor — vanilla. Perhaps, the flavor isn’t the only thing that we love so much about vanilla. Recent research suggests that vanilla may have anti-depressant activity and the vanilloids in the vanilla have potent anti-inflammatory properties. One of the vanilloids, which is called vanillin, has also been found to bind to specific receptors in your body, disrupting some of the pathways involved in pain. Altogether, vanilla might be so popular because of how much better it makes us feel, and its subtle unique flavor is just a red herring. By following this keto-friendly recipe, you’ll be able to get all of the benefits of vanilla without having to consume disease promoting processed sugars. 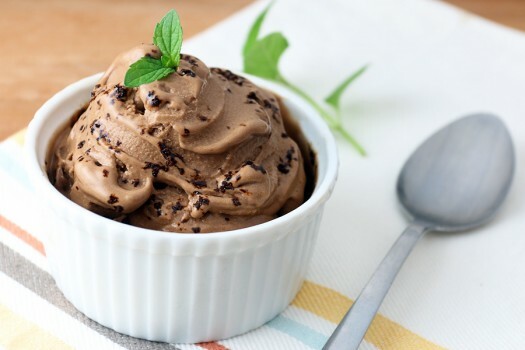 If you prefer chocolate over vanilla, but still want the health benefits of vanilla, then this low-carb chocolate ice cream will be your new go-to dessert. This recipe features dark chocolate and cocoa butter, which will provide you with that melt in your mouth chocolatey deliciousness along with cocoa’s unique combination of healthy fats. The dark chocolate, in particular, contains plenty of fiber, magnesium, copper, potassium, iron, and manganese. It is also loaded with organic compounds that are biologically active and function as antioxidants. One study showed that these organic compounds are so potent and found in such high quantities in cocoa that dark chocolate and cocoa powder have more antioxidant activity, polyphenols, and flavanols than the many other fruits that they tested, including antioxidant-rich blueberries and Acai berries. Altogether, the organic compounds in cocoa help improve blood flow, reduce blood pressure, optimize cholesterol levels, and boost brain function. 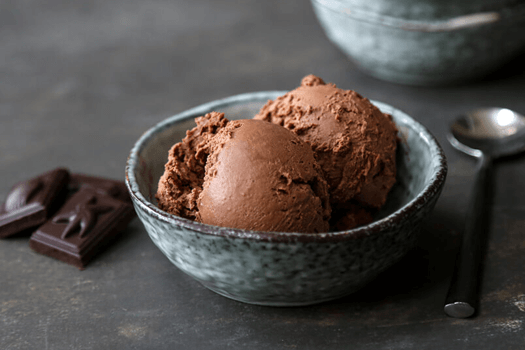 When you combine this with the health benefits of the egg yolks, vanilla, and heavy whipping cream that are also used in this recipe, you’ll have one of the healthiest chocolate ice creams known to man. For those that can’t handle dairy for any reason, it is difficult to find an ice cream recipe that won’t cause digestive issues. 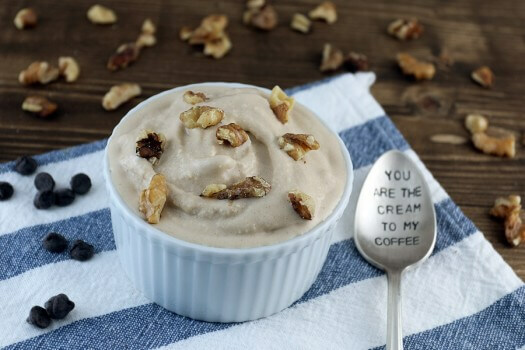 If you are one of these people, then this keto ice cream recipe is for you. Instead of high-fat dairy, you’ll be using eggs, cocoa butter, coconut oil, MCT oil, and ice cubes so that you can make a lactose free and dairy free low-carb ice cream. From a health perspective, the best part of this ice cream recipe is that it uses so many eggs and MCTs. You already know how much of a nutritional powerhouse eggs are, but do you know that MCTs will boost your ketone levels and increase your fat burning capacity? If you eat this ice cream with lunch or breakfast, then the MCTs will provide you with so much extra energy that it will curb your cravings and decrease your appetite for the rest of the day. When you are making this keto ice cream, feel free to add some of your favorite berries, keto-friendly chocolate sauce, or sugar-free chocolate chips for more flavor and even more health-promoting properties. No matter how much you want to indulge in ice cream, it is crucial to eat it in the context of your goals. Depending on how much weight you want to lose or gain, your daily macronutrient needs will change. As a result, this will alter the amount of ice cream that you can eat if you want to get the rapid results. To find out how much you need to eat based on your specific goals, we suggest using our keto calculator. Once you know how much you need to eat, you will be able to figure out how much ice cream you can consume so that you stay on track for your body composition goals. Mix cocoa powder with melted coconut oil and your favorite sweeteners to make a high-fat chocolate fudge that you can drizzle on top of your ice cream. 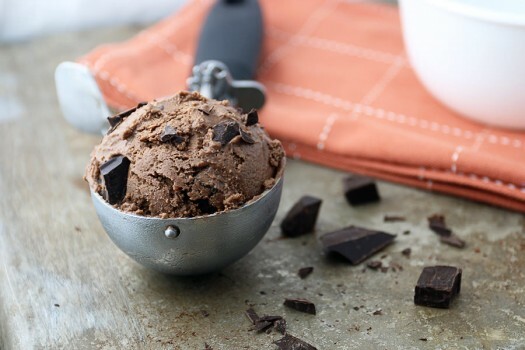 Add some sugar-free, low-carb chocolate chips to your ice cream. Make some Thick and Sticky Maple Syrup or Keto Caramel and drizzle it on top. Grind up some of your favorite nuts to top your ice cream with. Mix in some peanut butter with the ice cream. Grind up some of your favorite high-protein nuts (e.g., peanuts, almonds, and pistachios) and add them on top. Make keto brownies and crumble them on top of your ice cream. It’s time to make ice cream healthy again. Yes, it was healthy at one point — but then we decided to add tons of sugar and processed ingredients to it. Once you get the hang of making keto ice cream, feel free to experiment with the different ice cream bases, preparation methods, and keto-friendly ingredients to make even more delicious ice cream flavors. Soon you’ll be able to make low-carb, sugar-free ice cream that is much better than all of your sugar-filled favorites.